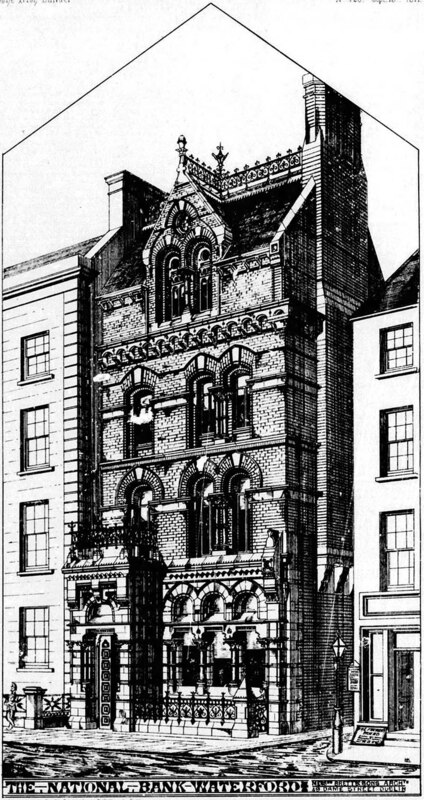 Elaborate commercial premises designed in a Ruskinian Gothic as offices for the National Bank of Ireland. In good repair, the building has decorative polychromic brickwork above a granite ground level. The richness of the details and materials used was symptomatic of banks and insurance companies of this period as they attempted to impress the rising Catholic middleclasses. “The materials of which the building is constructed, up to the level of first floor window-sills are limestone with Aberdeen granite shafts, and Portland stone caps and bases. The front over first floor is faced with Bridgewater brick, moulded bricks being used in jambs and arches of windows. The shafts are of limestone, with caps and bases, and also the bands, strings, and imposts, of Portland stone.” The Irish Builder, September 15 1877.